© Alan & Linda Detrick, Ellen Spector Platt design. 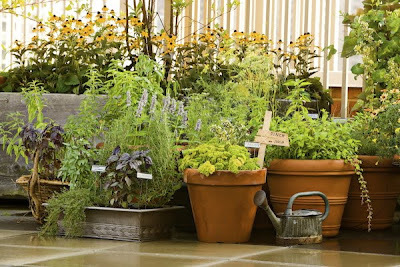 I grow culinary herbs on our condo rooftop and make them available to everyone in the building. Fortunately for my selfish needs, 95% of the residents don’t seem to cook, or don’t like fresh herbs, so there’s plenty for the few of us who do. I usually have old favorites like basil, thyme, rosemary, lavender, cilantro, dill, mint, perilla, calendula and anise hyssop but the collection varies from year to year and I’m always excited to try a new taste. This year I NEEDED Stevia rebaudiana, commonly called honey leaf, candy leaf, sweet leaf, or sweet herb, and I planted two 4" pots in larger containers. quite undistinguished. It grows as a small shrub with shallow roots, native to tropical and subtropical regions of South America like Paraguay & Brazil but it won’t winter over here. Plant after soil has warmed, in New York City, late May or early June, in an area with excellent drainage. as an herbal supplement. Sweetness depends on the concentration so recipes are hard to figure. Above: Stevia hanging to dry in my NYC closet, with peonies, lavender, goldenrod, etc.. Try a crushed fresh leaf or two in a pitcher of fresh lemonade or iced tea. To sweeten hot tea or coffee, brew along with the tea leaves or coffee grounds. Buy stevia in spring at your favorite nursery or on-line from an herb grower like my favorite, Well-Sweep Herb Farm in Port Murray, New Jersey. Now if I can only stop myself from reaching out and nibbling on the sweet stuff every day I might have a plant left come spring.